Zip Line and Tubing/Rafting on the Great River - Barrett Adventures the Real Jamaican Adventures. For those who want to maximize your day, try doing the zip line and tubing together. Thrill to the rainforest heights in the morning and then cool down in the rapids in the afternoon. Between the third and forth lines we stop for some local refreshment. Our guide is opening a young coconut so that we can have some coconut water. They also hand out some mature coconut meat and pineapples from their own garden. After the zip line it is a short jaunt down the road to where the tubing or Bamboo Rafting starts. 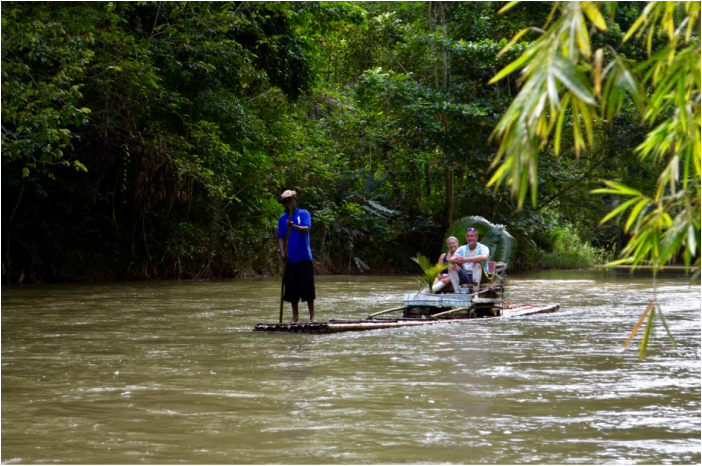 Your driver will take you to the start and take care of your belongings while you tube down the river. He/she will then meet you at the bottom and take you to lunch and shopping, if you wish, on your way back to your resort, or cruise ship.